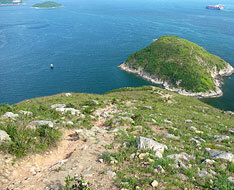 Yuk Kwai Shan, 196m in height, is located at the southeast of Ap Lei Chau in the south of HK Island. 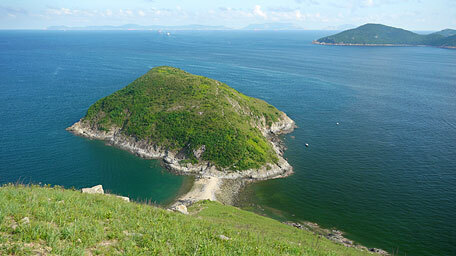 There is a small island named Ap Lei Pai linking with sandbank at its end. 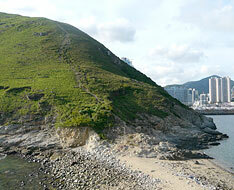 The uphill and downhill paths of Yuk Kwai Shan are very steep, it would require clambering. Recommand to prepare gloves. 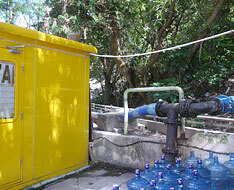 The trail starts by climbing the planter wall then following it behind the yellow bus-staff room at the bus terminal of Lei Tung Estate beside the hillside. Along the planter wall to the left, it then ascends the left flight of concrete steps of the retaining wall. Up to the wire netting, the trail follows the left muddy path. 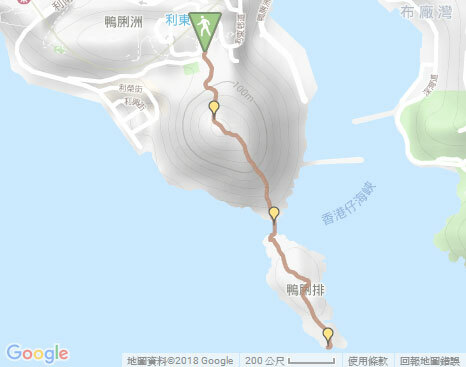 Gently up to the junction with the land notice of the government, still go ahead up (the right path could also climb the hill but it is very very steep). 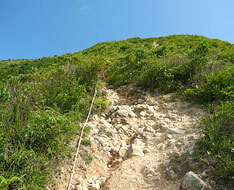 After join the main uphill path which have some ropes, follow it to the left. 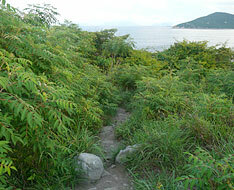 Not far ahead, the path sharply turns steep with loose gravel in part sections. 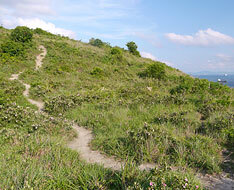 After the steep climb, it pushes to the hilltop. 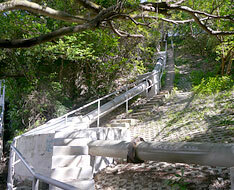 Note: The uphill and downhill paths of Yuk Kwai Shan are very steep, it would require clambering. The top is smooth and very open. 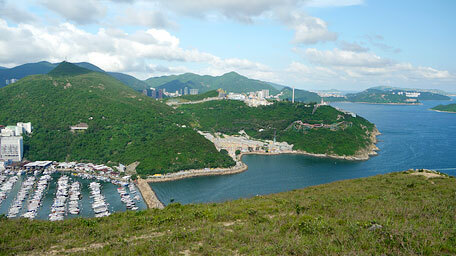 Looking back to the north, it offers a panoramic view, from the left High West showing the head, undulating and contouring along the range eastward to the Victoria Peak, Mount Cameron and Mount Nicholson. 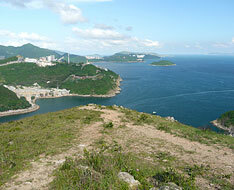 Gazing to the east, near Ocean Park's promontory, Brick Hill and farther The Twins could be seen. 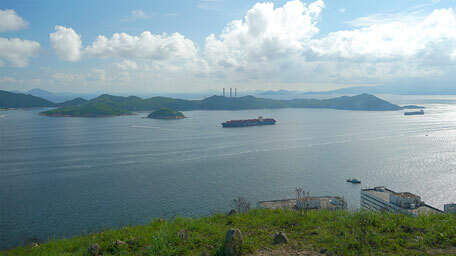 Overlooking southward, the sublime view over Lamma Island and East Lamma Channel in the background of the boundless blue horizon. Continue on along the trail ahead roughly toward the south. It slowly descends then sharply turn steep like slipping downward. 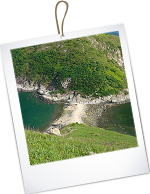 At that time looking down, there is a small island linking up with the short sandbank as if a child being led by a mother - Ap Lei Pai. 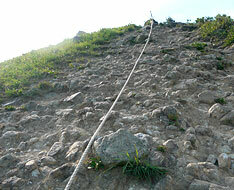 Further down, the path is more steep covering with more loose gravel where requires clambering down. Afterward it descends to the sandbank like a white carpet. 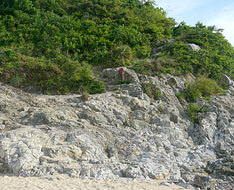 Head to Ap Lei Pai by passing through the sandbank, then follow the path in the upper-right. 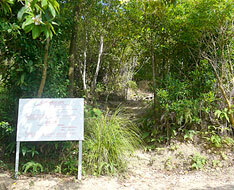 Through the small shrubland, it becomes gentle and smooth. Look back to Yuk Kwai Shan, it is not high and the top is rounded but the surrounding hillsides are very steep that seem to fall down into the sea which could not look down on. Continue to head the trail, beyond the knoll it gently descends. 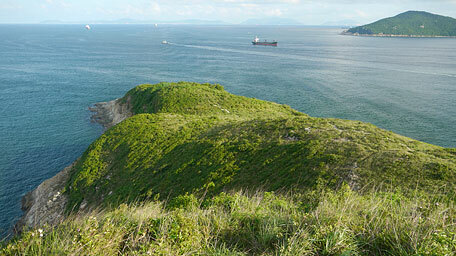 After passing through the woods, it leads to the coast at the south end of the island. Gazing to the lighthouse and its shadow, it seems to be a lone wanderer standing at the end and emptily shouting toward the sea in the golden sunset turning dark. 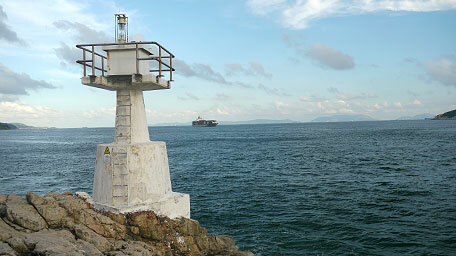 Climb down over the rocky shore, it comes to the lighthouse. 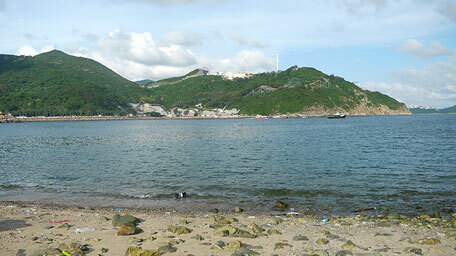 The large ships and the sampans frequently come and go through the channel. 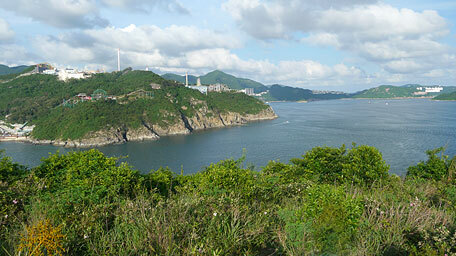 Moreover, it is agreeable and comfortable for the gentle sea wind and the sea odor as if embraced by the sea. 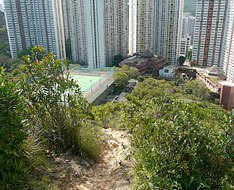 Finally, retrace the steps to return to the bus terminal of Lei Tung Estate. 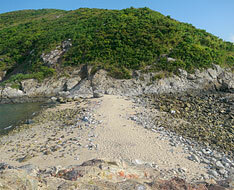 Note: Please enquire for the tide times if go to Ap Lei Pai over the sandbank. 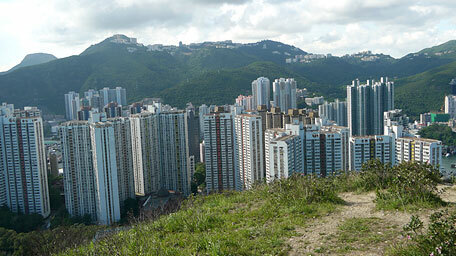 Yuk Kwai Shan towers just behind the concrete forest like an isolated green hill among the sea. 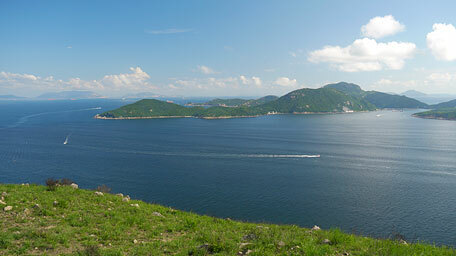 At the top, it seems to go to the big garden in other world where could enjoy the grand mountain seen and the splendid sea view. However, could our gardens for relex, recovery and even breath be still preserved?